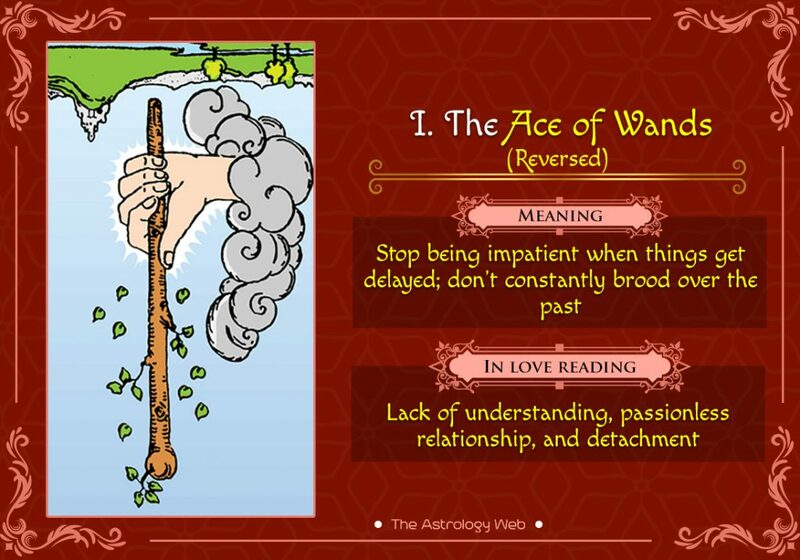 The Ace of Wands is a card that belongs to the first suit (Wands) of the fifty-six cards called Minor Arcana in a traditional seventy-eight tarot card deck. Used for playing and divination, its suit element is fire. Against a silver-gray sky, a white hand is popping out from a bulbous cloud, holding a piece of a tree branch with leaves and thin secondary branches that represents the Wand. At a far distance to the left is a chain of mountains on which sits a castle. There is a brook with crystal clear water in front surrounded by verdant trees. The Ace of Wands signifies new beginnings, taking bold steps, and feeling motivated to do something innovative. The hand emerging from the cloud symbolizes creativity, endeavor, and energy. The leaves on the wand stand for spiritual progress and mental balance. The castle situated on the mountain depicts materialization of ideas. While the brook refers to the free flow of thoughts, the trees symbolize abundance and growth. It represents a powerful person who follows a creative and spiritual way to fulfill all his desires. He will try till the end to make things happen despite obstacles. 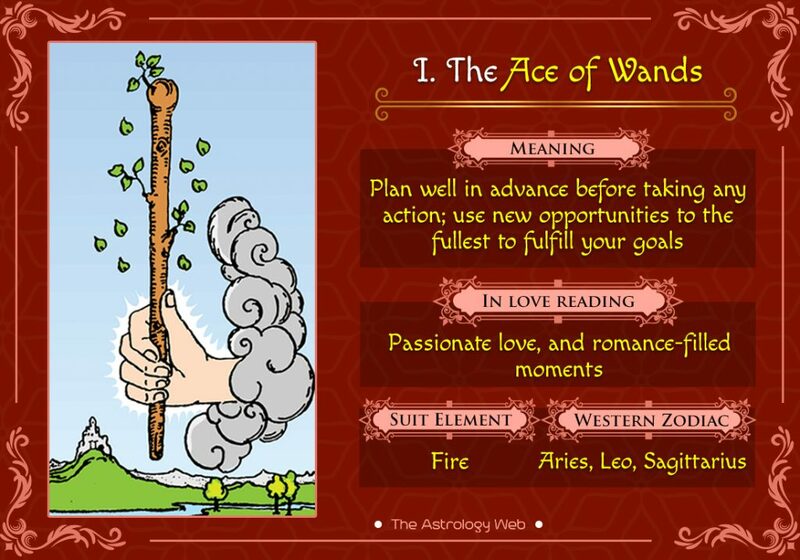 If you have come across a highly passionate and individualistic person in your life, it could be the Ace of Wands. You are feeling motivated and positive about everything around you. There is an urge to find similar people as well who share the same passion as you do. As per the suggestion of the card, you should wait no longer and start with a new venture or project. It is the right time to work on your ideas and take immediate action without any delay. 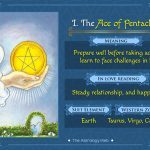 Interpretation: In this position, the card indicates that you need to follow your instincts, planning everything in advance, so whatever you have dreamed gets fulfilled. You are right now feeling motivated to get exposed to a new world brimming with opportunities. The card suggests you make the best use of the opportunities to do something more substantial in life. If you work hard with a clear mindset, nothing can stop you from achieving your goals. 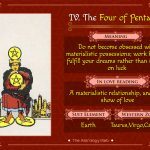 Interpretation: If you are in a relationship, the appearance of the card could be a positive sign, indicating passionate love and romantic outings. It could also mean the beginning of a new phase in life such as engagement, marriage, or birth of a child. Those who are single should not be hesitant, approaching someone they like. Career and Work: You will love taking challenges at your workplace and use them as opportunities to build your career path. There is a high possibility of cracking an interview and bagging your dream job. Finance and Business: Apart from getting good returns from various investment funds, you might receive expensive gifts in the form of property inheritance and unexpected income. Health: You would be bestowed with good health according to the Ace of Wands. For the betterment of your physical wellbeing, start a healthy routine as soon as possible to stay in shape. Interpretation: In the upside-down position, the card could mean that you are unable to clearly define goals, moving aimlessly in different directions, thereby exhausting yourself. You still doubt your abilities without realizing the exact aim of your life. It would be advisable to wait patiently for the right time instead of getting unnecessarily frustrated with the ongoing delays. Try to let go of your past emotional baggage and pursue your newfound dreams. 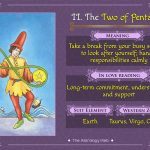 Interpretation: In the reversed position, the love card does not suggest a long-lasting relationship as it predicts passionless love, arguments, and detachment. If you want to stick to your partner, clear all the misunderstandings first before renewing the relationship. Career and Work: You no longer have the enthusiasm to finish an assignment due to constant delays and hurdles. If you are searching for a new job, don’t expect anything positive now. Wait for a while till things get better. Finance and Business: If you have a major chunk of your money invested, there could be some unexpected losses. There is a necessity to consult a financial advisor who can help you with your finances and suggest something more feasible. Health: You are unable to start with a new health regime due to lack of energy. The more you procrastinate the more are your chances of experiencing health problems in the future. 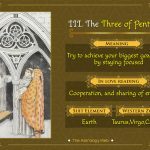 Past: In this position, the card refers to a past event when you grabbed a chance without thinking twice. Taking such an action either had a positive or negative result, but at least you were able to derive a lesson from it. Present: There might be an important opportunity coming up in your life that could change your life forever. It is left to you as to how you can make the best use of it. Future: In the coming years, you will see a positive outcome in your life. However, don’t expect it to come just like that without putting any efforts. All you have to do is stay focused on your goals and mold yourself into a confident person.